Another podcast, another infrequent guest. Derek Mayfield made his first appearance since right before the 17th Annual Classic last year. Matt Endsley carved out time for his second appearance this season along with anchors Geoff & Jaime. Podcast four is now on iTunes or you can stream from the website here. The dress code has been impelemented with penalties for non-compliance outlined on the show. The entry fee will be raised to cover the cost of your customized Shangri La’ jersey with numbers and names. The public has spoken and a stats committee, headed up by Derek Mayfield, has been formed. 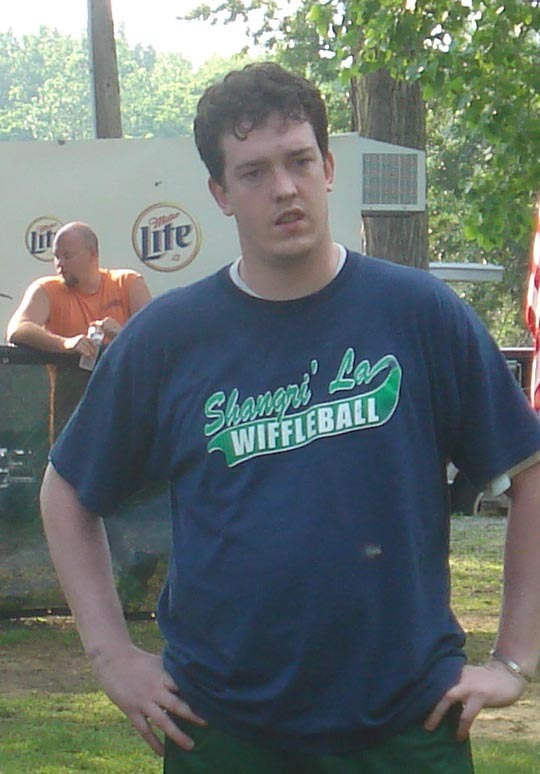 Send any ideas about what stats to keep and how the process should be modified for wiffleball to slwiffleball23@gmail.com. Questions are needed for the next podcast. 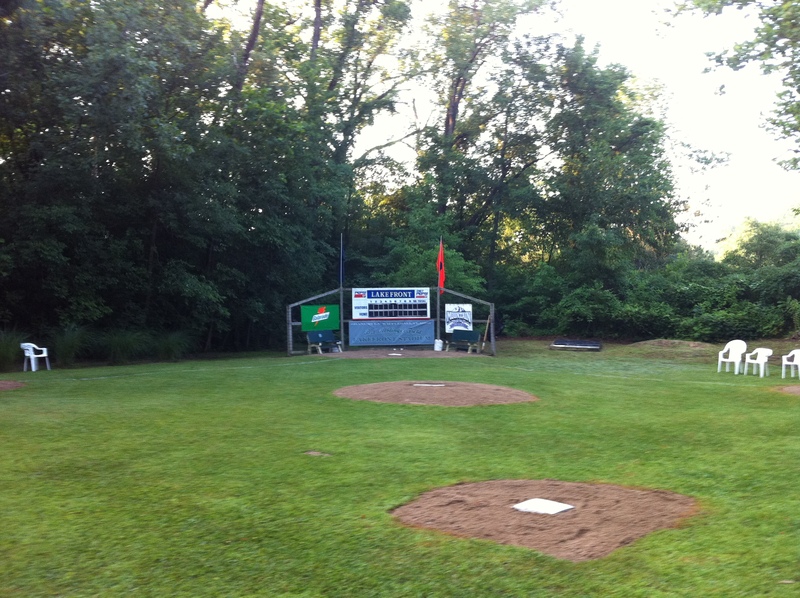 Please send whatever you may have to slwiffleball23@gmail.com. Hello wifflenerds! 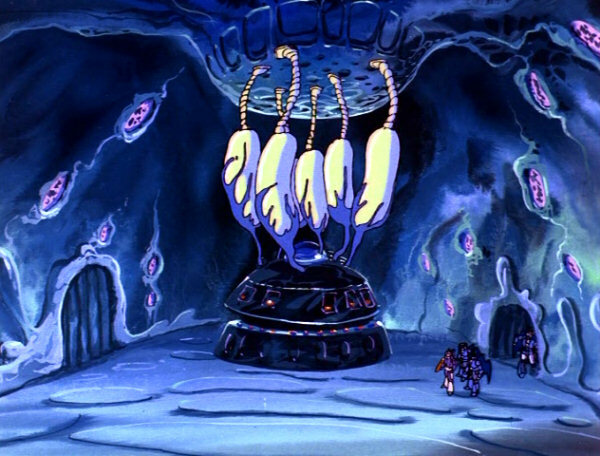 I am fully refreshed and ready to fulfill all of your wettest analytical dreams after emerging from my annual medically-induced winter hibernation in my hermetically-sealed osmosis-cocoon. First things first. 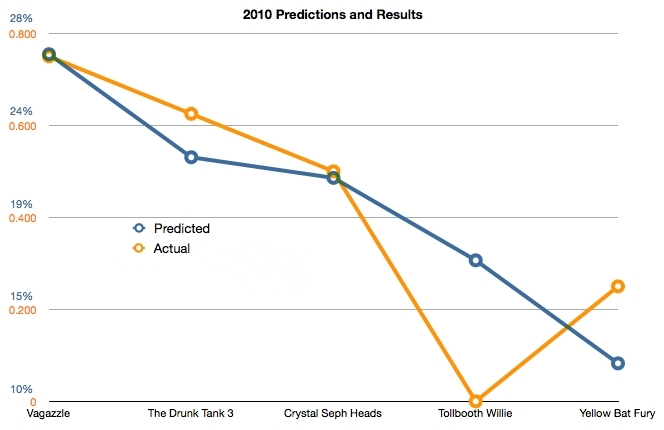 You might recall that, as part of the run-up to the 2010 festivities, last year’s championship odds were calculated using my patented Wiffleball Champion Prediction Model. Let’s see how those numbers held up. You don’t exactly have to be a Chief Scientist to see that the predictions ended up being, in technical terms, pretty damn close. I’m told that SLW Alumni Association President Geoff Hixson has submitted a proposal to the Commissioner’s office that, if approved, would end the need to play future games, as the winner would simply be calculated and announced, simultaneously increasing both the time allotted for beer drinking and the chances that he might someday actually win a tournament. Please direct any questions or concerns to the Commissioner’s office. Call it strong pitching or weak hitting; the result is the same. 2010 was the lowest scoring in at least the last five tournaments. 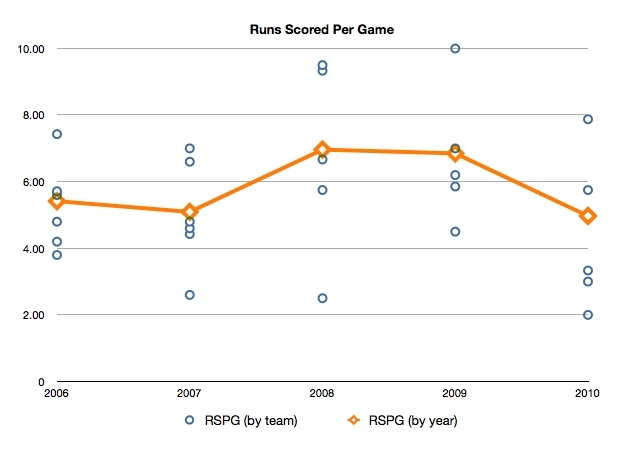 Just under 10 runs per game were scored on average, down from just under 14 runs per game in 2008 and 2009. The “bottom 3” (Yellow Bat Fury, Tollbooth Willies, and Crystal Seph Heads) teams proved to be particularly futile. 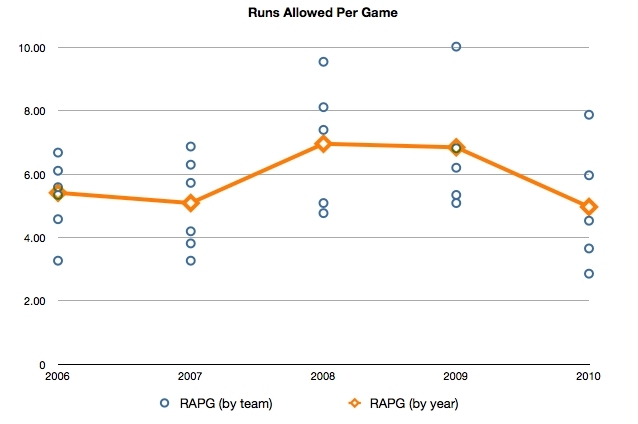 They combined to average just barely more runs per game than Vagazzle did alone, and they each rank in the bottom five in runs scored over the last five years. Yellow Bat Fury wins the award for most anemic team ever by averaging 2 runs scored per game in their 4 games, including the “Greatest Pitcher’s Duel Ever” opposite the Crystal Seph Heads, an extra-inning affair (was it 8 or 9 innings?) in which Yellow Bat Fury only managed a single run in a heartbreaking 3-1 loss. On the other side of the coin, Vagazzle and Crystal Seph Heads proved to be particularly stingy in allowing 3 (best in statistical era) and 3.833 (4th best) runs per game, respectively. 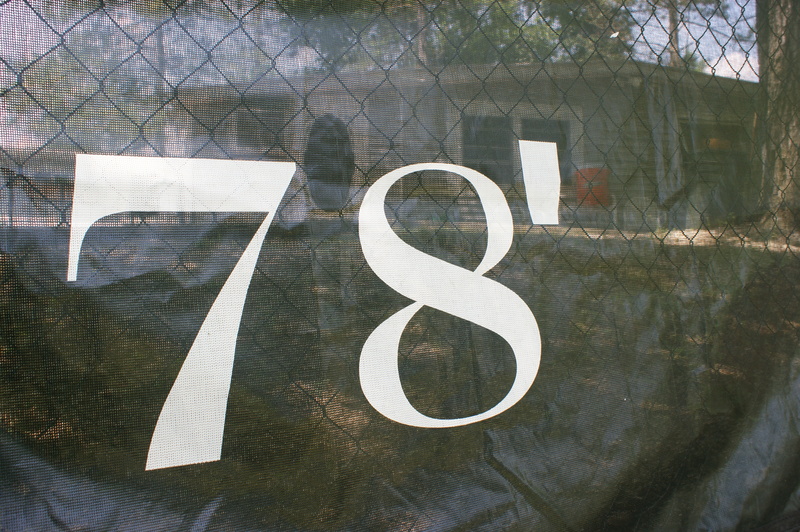 Next time, I’ll uncover some frightening trends and provide a solution for evening out the SLW playing field. Stay tuned. 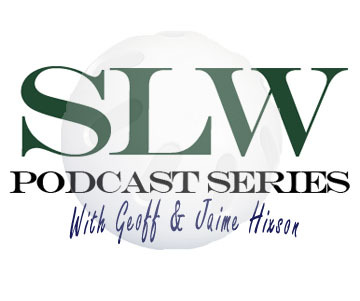 Fresh Guest Year continued tonight as the SLW Podcast Series welcomed first-time caller Shane Gentry to the third edition of this year’s show. James Morton was back for his second appearance this season along with staples Geoff & Jaime. Podcast three is now on iTunes or you can stream from the website here. Shocking news of an impending SLW re-brand & subsequent logo change was the most notable item discussed. Questions are needed for the next podcast. 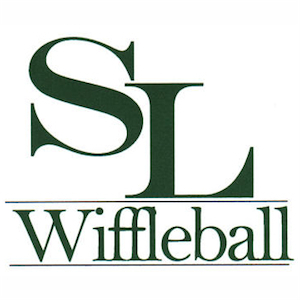 Please send whatever you may have to slwiffleball23@gmail.com. Also, please answer the poll question below.